Russia supports the Syrian affiliate of the PKK terrorist organization, the People's Protection Units (YPG), which is trying to take control of the Azaz region in Syria near the Turkish border. While the YPG attacks opposition forces in Azaz, Russian aircraft have staged three airstrikes against the road linking the district with the Bab al Salameh border gate. The YPG said it is preparing for an offensive on the western Euphrates, which Turkey described as its "red line." Sources claim Russian aircraft have also attacked the frontline where the YPG is fighting opposition forces north of Aleppo. On Thursday, Russia attacked Deyr Cemal, a town north of Aleppo, aiming to stop the advancement of opposition forces. On Wednesday, Russia attacked vehicles in the same region, killing seven people and injuring 10 others; 20 vehicles were also destroyed. Separately, Russian aircraft also attacked opposition forces on the ground in the towns of Malikiye and Ziyara, north of Aleppo, in support of the YPG in last two days. Last week, Russian jets also attacked opposition forces in Deir Cemal and Meryemeyn in attempts to open corridors for the YPG and Syrian Democratic Forces. 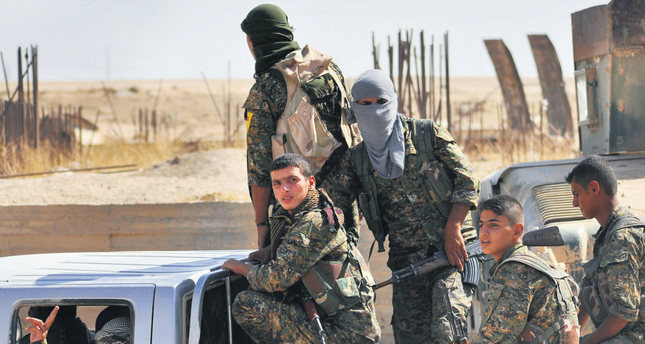 The YPG expanded its territories toward the west after taking control of Tal Abyad from DAESH in June, a region mainly inhabited by Arabs and Turkmens. However, in order to merge Kobani with the Afrin region, the YPG must first take control of the DAESH-controlled Jerablus region and opposition forces-controlled Azaz region. In order to achieve that goal, the PYD has reportedly begun its rapprochement with Russia. Two days before Russia began its air campaign in Syria on Sept. 30, Russian President Vladimir Putin said only the regime of Bashar Assad and the YPG were truly fighting DAESH, giving a signal of rapprochement with the Kurds. Only 11 days after Russia began its air campaign in Syria, Russian Deputy Foreign Minister Mikhail Bogdanov met with Democratic Union Party (PYD) Co-Chair Salih Muslim in Paris. On Oct. 21, Bogdanov also met Asya Abdullah, the other PYD co-chair, in Moscow. The meetings were followed by the initiative to open a PYD office in Moscow. On Oct. 23, Putin said the Assad regime and the PYD need to unite forces, and called on the organization to come over to the regime side in the Syria conflict. Furthermore, at least 20 civilians, including women and children, were killed Friday when the Revolutionaries Army (Jaysh al-Thowwar) attacked a village in Aleppo province. The source said the armed group, which is cooperating with the YPG in Afrin and Kobani, attacked the opposition-controlled Tanab village. Yaser Abdurrehim, an opposition leader in Aleppo, said that opposition forces retook control of Tanab village. He denounced the killing of civilians by the "self-proclaimed revolutionaries." At least 250,000 people have been killed since the Syria conflict began in 2011, according to U.N. figures, with 7.6 million internally displaced and more than 4 million having fled to nearby countries.